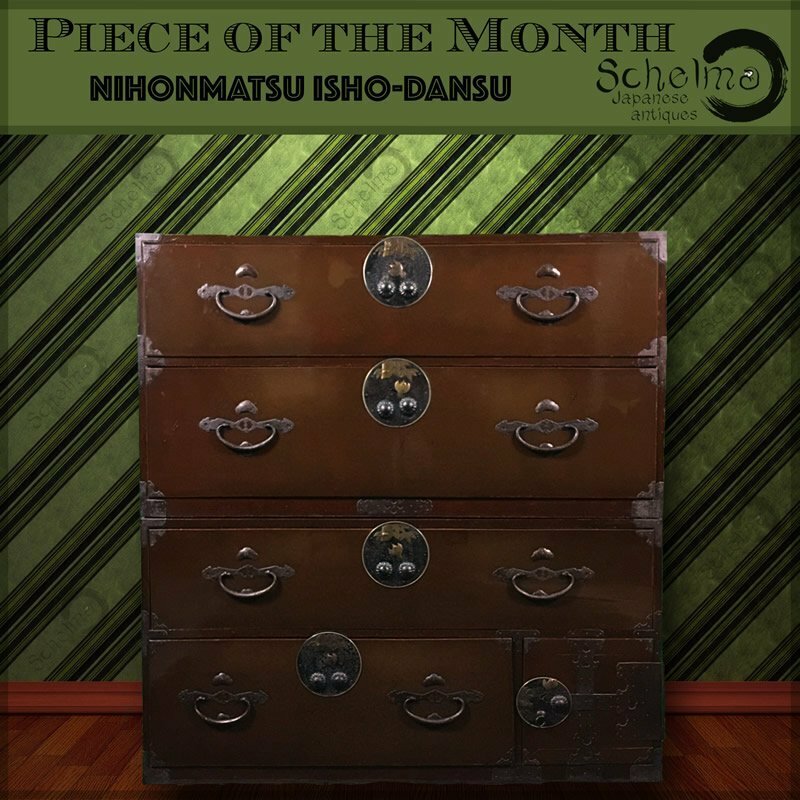 The oldest signs of Japanese furniture or "tansu" date back to the 8th century. This period was particularly marked by chests and shelves of Chinese influence which were then only used by the court and the leading lords. It is only in the 18th century, in the mid-Edo era (1603-1868), when furniture has become popular in the common people's houses. However, it appeared with a specific characteristic to the Japanese dwellings: a deep interest in empty spaces and simplicity. 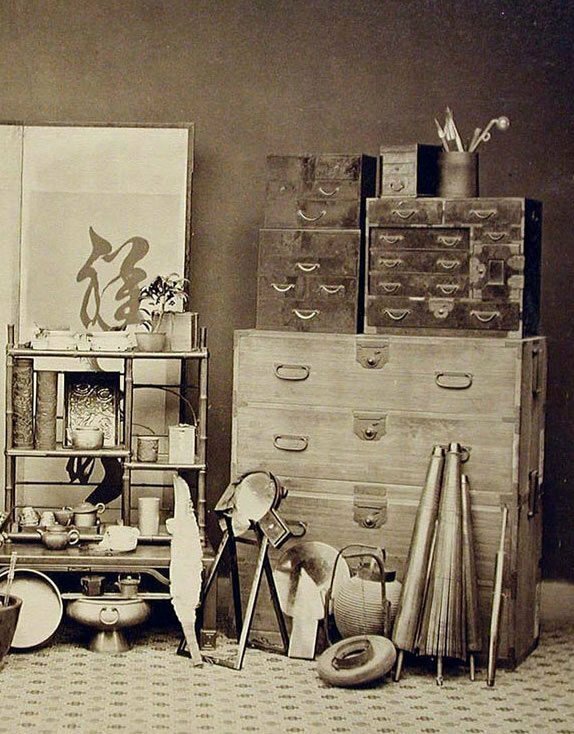 The Japanese furniture is firstly used as a storage unit given its utilitarian nature, and this particularity makes it radically different from furniture found in the West which is primarily designed for pleasing the householders' eyes by decorating the large spaces of their residences, contrary to the Japanese interiors which are smaller. 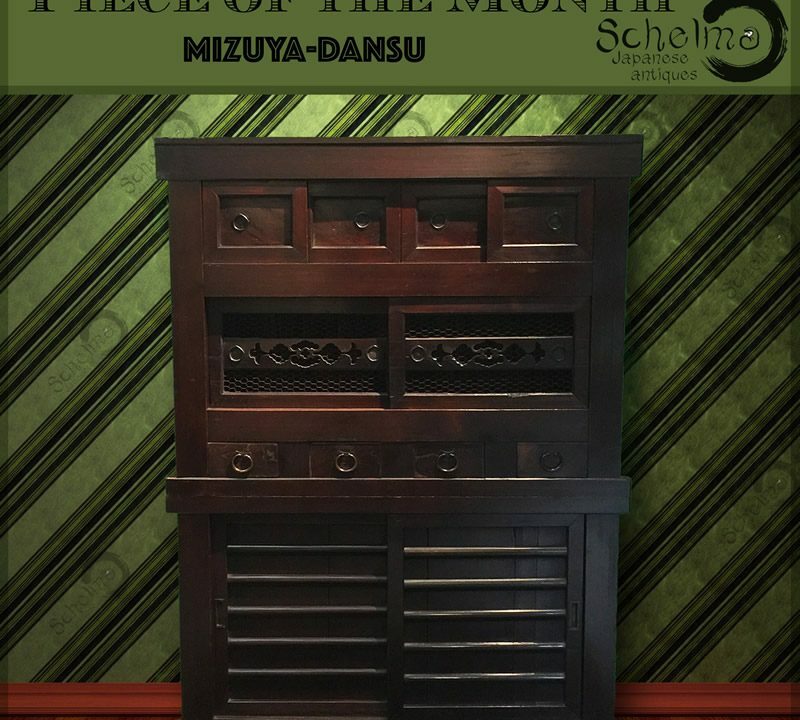 It was with the end of the feudal system and the democratisation that came with the Meiji period (1868-1912) that Japanese furniture experienced its golden age. The abolition of the supreme power of the Samurai and tax regulations enabled people to live decently. They were no longer afraid to reveal what they owned, so furniture and various other objects began to proliferate. Most of the pieces found on the antique market today date back to this period. Older pieces were rarely kept by their owners, given their basically utilitarian nature. In Japan, as elsewhere, when things get damaged, they are replaced. In recent years the success of Japanese furniture has unfortunately given a rise to a market for imitations and for "over-restored" furniture. This regrettable trend is not specific to this type of furniture alone, but applies to all old pieces, wether Asian or European. 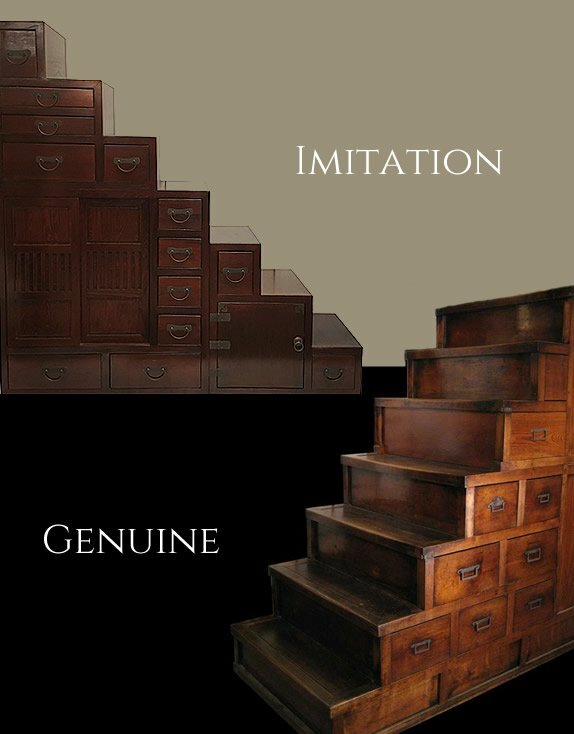 The most frequently copied pieces are obviously those which are the most commercial or which are expensive to buy. First among these, by far, are kaidan and mizuya dansu, as well as Sendai (isho) dansu with its spectacular ironwork. Generally speaking, Japanese furniture is not finished on the inside, which is neither varnished nor waxed. 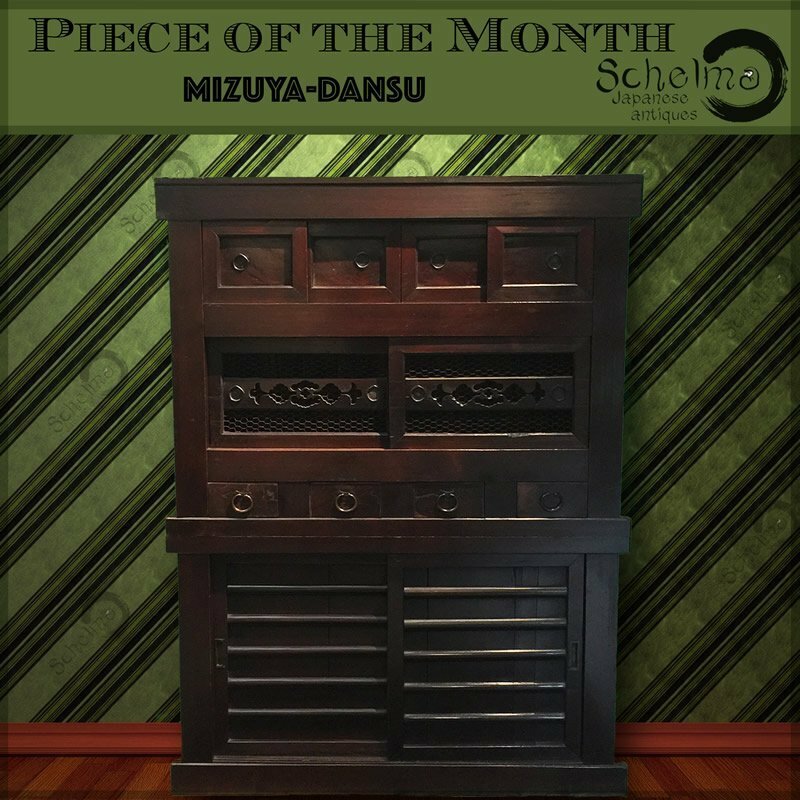 When you open a drawer in a piece of Japanese furniture, the wood should be its natural colour and show normal wear (mizuya pieces, used on a daily basis, are more worn, while isho furniture, which is used less frequently, is less so). 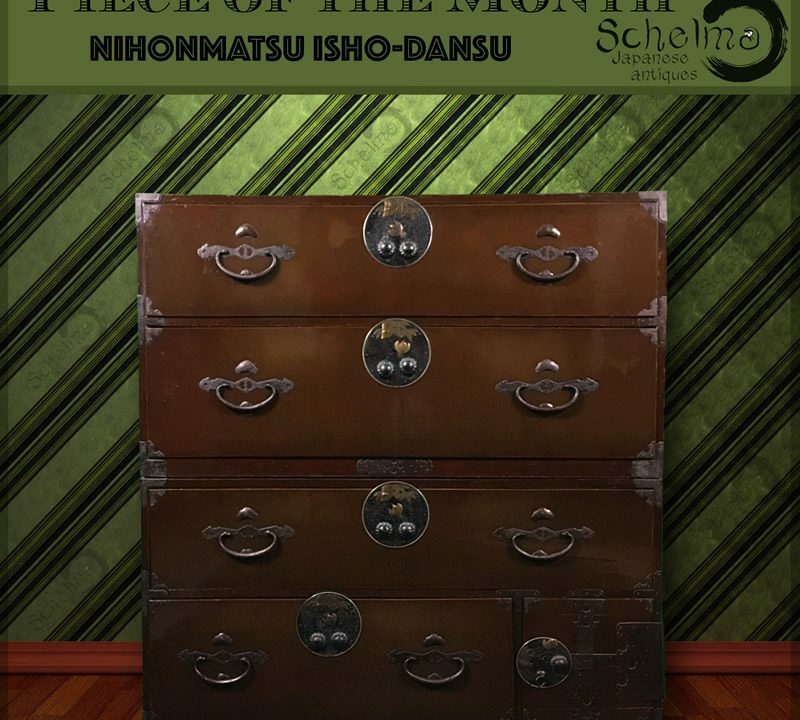 Both the bottom of the drawer and the board placed beneath it should show signs of wear in the direction in which the drawer moves, as Japanese drawers do not rest on guide bars but are placed on boards which cover the entire base. As these boards are usually made of cedar or cypress, the wood becomes worn very easily, not only as a result of use, but also through age. The drawers are assembled using wooden pegs, sometimes made of bamboo. Rectangular pegs are found in the older pieces or even, more rarely, rectangular or square hand-made nails. During the Meiji period, both the pegs and the nails became round. In the early 20 th century a mixture of industrial metal nails and wooden pegs (particularly in the sides of drawers) may be found. The simplicity of form, often using straight lines, and the restrained decorative style which make it possible to integrate the furniture into interiors which are often sober, dominated by empty spaces, have had a great influence on tansu design. The specific lifestyle (living without shoes, sitting on the floor) has also determined styles: no legs beneath pieces of furniture which are often low, with drawers and easily accessible while seated on the floor. This lifestyle, which is characteristic of Far-Eastern civilisations, will also have influenced the aesthetics of the furniture. Hence the front is far more important than the other sides, which are considerably less elaborate. Asymmetry is also an important element in furniture design. It is also found in other Japanese arts, such as ikebana (flower arrangement) or architecture. Japanese furniture can often be divided into 2 or 3 parts with handles on the sides, which may call to mind trunks designed for travelling. In fact, it wasn't really for travelling, which was rare if not banned during the Edo period, in order to keep possible rebellion under tighter control. It was above all to "save the furniture" and property in the event of fire, a frequent occurrence because of typhoons and earthquakes, which easily destroyed houses made of wood and paper. The woods used are mainly light, such as cedar and cypress, sometimes the far more highly prized paulownia, in order not to add too much weight to these "chests". More decorative, heavier woods, such as zelkova, chestnut, cherry or even shioji, tamo or persimmon are often used only for the front. Some woods imported from China are also used, particularly for decorative shelves. The front is often coated with lacquer which resembles our varnishes, allowing the grain of the wood to show through, or is covered with a thick opaque lacquer. The wood may also be left in its natural state, which is often the case with paulownia wood. 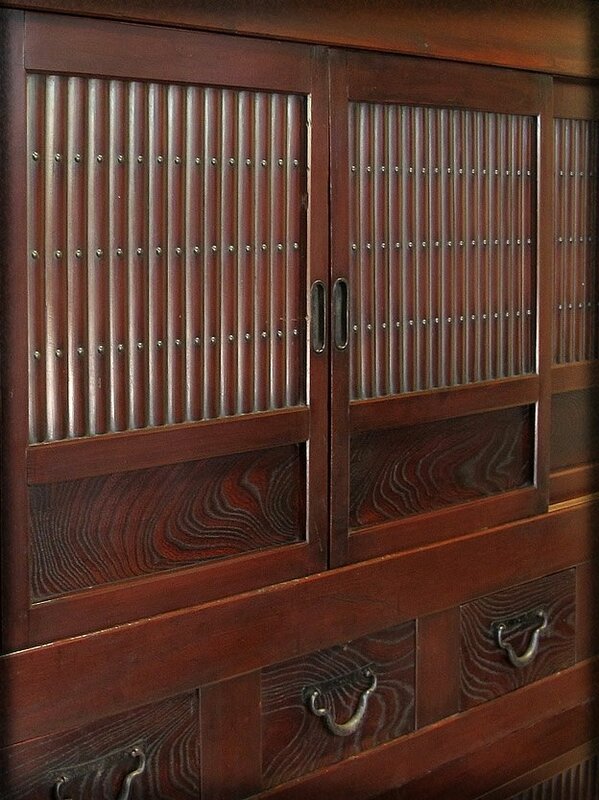 Ironwork is an important element in Japanese furniture : very sober in the South, on the island of Kyushu, it may become a genuine work of art, scarcely allowing the wood it covers to show through, for example in Sendai in the North.